Very pleased with how my latest batch of handspun turned out. I think this is my best yarn to-date. (You can vote for it here if you are so inclined. Just click the 'love' button below the post. Be sure to check out the other great yarns. You can vote for as many as you like.) 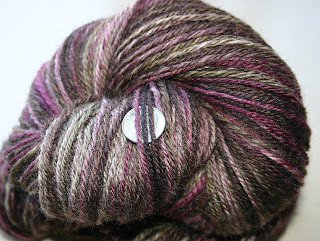 It's 256 yards of super soft 3-ply BLF (Blue Faced Leicester) from All Spun Up's Etsy shop. Loved spinning it; loved plying it; going to love making a scarf from it very soon. 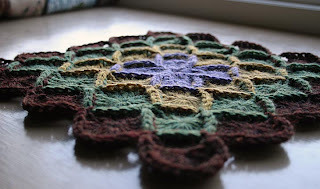 The block is worked from the center like a granny square, using a modified Katherine Wheel stitch. 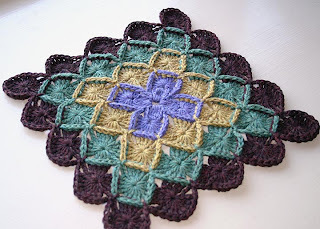 Very easy to do; the hardest part was remembering to put the 2 chain stitches after each corner turn. Great way to use up stash without getting bored out of your mind.